Packing for ultra-light adventure is like solving a puzzle — carry too little and you flirt with epic failure; carry too much and you get in your own way. But when push comes to shoved between a rock and a hard place, there’s no substitute for a good night’s sleep. I choose sleeping gear carefully. Last summer my choice for deep backcountry rest was the Brooks-Range Cloak 45. Brooks-Range is known for making minimalist gear designed around pure function, and its ultralight sleeping bags exemplify simplicity of design. Even by quilt standards, the Cloak 45 ($249) is basic, with no zippers, no hood and no bottom. 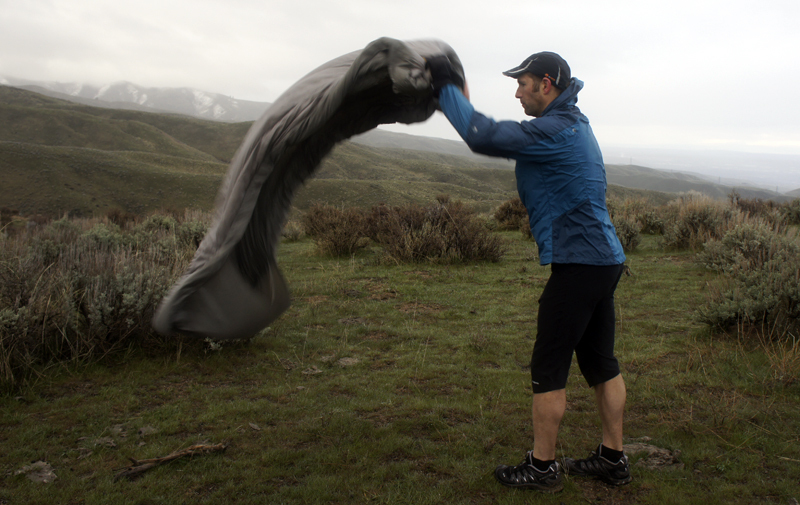 It’s a no-frills rectangular blanket that leverages a couple backcountry principles: The underside of any sleeping bag is compromised when compressed and that any adventurer worth their calluses brings a pad or improvises insulation with their kit. The Cloaks are offered in three fills: 45, 30 and 15 (the values match the preferred comfort range in ?F and are padded with the caveat of pairing with a quality sleeping pad). The Cloak 45 distributes down with sewn-through baffles, while 30 and 15 employ full baffle construction. The Cloak 45 is a modest 74” long x 40” (shoulders) and tapers to 28” at the foot. Under the foot, a nylon sleeve provides space to slip a pad (and feet) to pin the bag over your body. 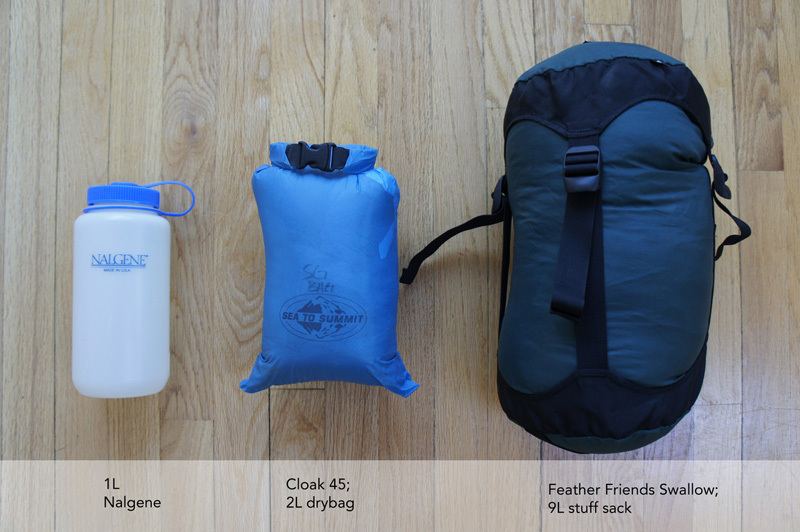 The Cloak 45 weighs 13oz and, while it comes with a 4L stuff sack, can pack into a 2L roll-top dry bag. All three Cloaks come with full draft collars, which while nice in theory are negligible around the sides and modest around the neck. Brooks-Range was one of the first companies to employ DownTek, a nano-treated down fill that imparts hydrophobic qualities while maintaining the loft of down, and it’s used in this quilt. While not a silver bullet, DownTek absorbs 30% less water and dries 60% faster than untreated down. The Cloak 45 distributes its 6.5 oz. of the DownTek 850 Grey Duck Down fill (a high quality loft by any standard), using “Insotect Flow” vertical baffle structure that the company claims distribute heat from head to toe more evenly than traditional horizontal baffles. Insotect’s internal “flow gates” are staggered along the vertical baffles, preventing down from shifting, resulting in a consistent 2-inch loft. It’s all packaged in a lightweight 15d DWR nylon shell that feels luxuriously soft. 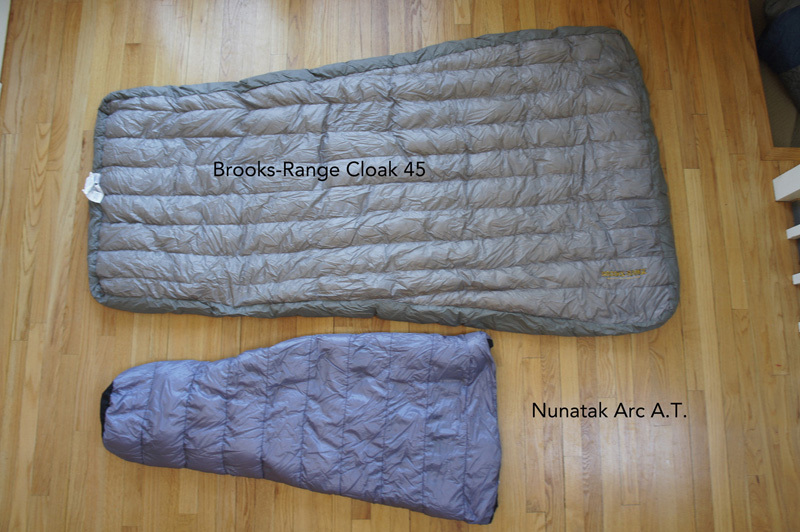 The Cloak 45 at top compared with the Nunatak Arc A.T. In September, a buddy and I pushed, pedaled and paddled a thin line between surf and turf on the Oregon Coast. 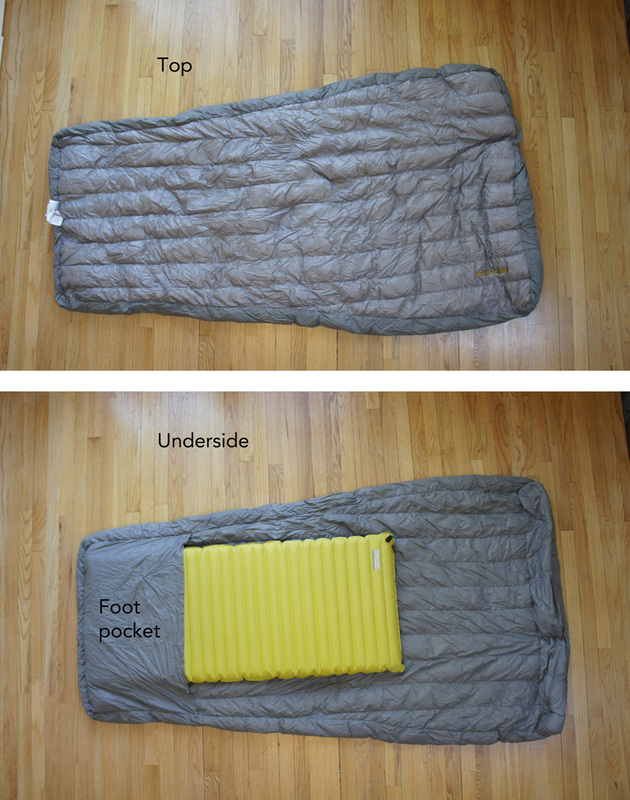 We brought two ultralight sleep systems: the Brooks-Range Cloak 45 and Nunatak’s 8 oz. 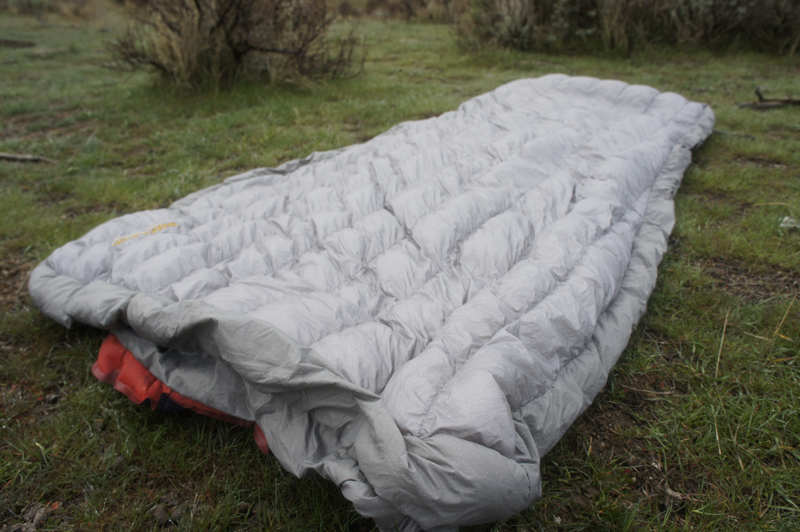 Arc A.T., an ultralight ½ quilt with 4oz. of 900-fill down. When paired with an insulated jacket, the ARC A.T. is rated to 40?. The Cloak 45 is spec’d to 45?F. We both paired our bags with a torso length Klymit Inertia X-Lite pad, slipped our backpacks under our feet as insulation from the ground and wore a mid-weight synthetic base layer and an insulated jacket (my partner used a 100g Primaloft jacket; I used a 100g Wool-aire loft jacket). The maritime evenings dipped down to mild 54? with 100% humidity—well within the comfort range of both bags. While neither of us was miserable using the Arc A.T., we both spent a restless night trying to curl into the ½ length quilt. We swapped out bags in the middle of the night — more or less out of pity for the other. The extra 20 inches from the Cloak 45 instantly amped the BTUs, and in spite of its minimal construction, it had no perceived cold spots. Coming from the high desert, we typically don’t worry much about moisture. Even in a storm, a tent will protect you most of the time. But with the high humidity, the Arc A.T. (with traditional down fill) sucked moisture out of the air, while the Cloak seemed impervious to the blanket of mist. DownTek has a clear advantage in humid climates. All three Cloak models (45, 30, and 15) are 74 × 40 × 28 inches and have no integrated hood. If you are a restless (or large) sleeper, you may find the cloak doesn’t cover you completely. This could be problematic as the temperatures drop and you are forced to try and tuck the bag to trap heat. For me, at 165 lbs. and a restful back sleeper, the Cloak 45 was superb. As for the lack of hood, I always bring a hooded jacket that provides more than enough warmth. Cost: The Cloaks are available for: Cloak 45, $249.95; Cloak 30, $299.95; Cloak 15, $369.95. These prices may seem high for what you get (or don’t get…being that it’s only a top bag). But they are competitively priced against other available quilts such as the Katabatic Chisos (40?F), $355 and Nunatak Arc Edge (40?F), $365. They are also reasonably priced against other high-end down bags: Marmot Plasma 40, $419; and Mountain Hardwear Phantom 45, $330. I highly recommend this niche bag for trips where warmth-to-weight ratio and packability are premium and a restful recovery is mandatory.